Usually you would do it at the beginning of a yoga practice and would come back to it throughout the practice and during the relaxation (Savasana). Intentions that we set should be positive affirmations set in a present tense. For example, you can say ‘I am grateful’ if you would like to cultivate the quality of gratitude, or ‘I am love’ if you would like to cultivate self love or love towards other people. By saying ‘I am not angry’ you bring the negative ‘not’ into your intention, but we can change it to ‘I am at peace with myself’ or ‘I am calm’, ‘I am aware’. Mudra is translated as a seal or a lock. Some mudras involve the entire body, but most of them are hand and finger gestures only. These are used in meditation and in everyday life to channel the energy within our body. Hands are closely connected to the brain. When we use mudras different areas of the brain get stimulated, thus creating specific energy flow. Each of the five fingers represents one of the five elements as well as certain body parts and organs. Mudras are creating the balance between the elements when those are unbalanced and are also balancing our health. Mudras work on similar principals of acupuncture and reflexology. We are redirecting the energy flow within our bodies by performing various hand and finger gestures. We perform mudras in our every day life without even realising that what we are doing is mudras. For example, you can catch yourself doing the Hakini Mudra when you are thinking deep about something or concentrating. Thumb sucking with other fingers rolled in is Mudra – helps to soothe and calm down. CHIN MUDRA – (tips of thumb and index fingers touching) – it is a Mudra of knowledge. It improves your focus, memory, helps with anxiety, stress and is performed for a better insight into your life or specific issue. It calms the mind and brings a more receptive state with it. Thumb represents universal consciousness and index finger – individual. When they are connected – you are connecting the individual self with the high self. BHAIRAVA MUDRA ( resting palm in palm with right one on top). This is a Mudra of healing, harmony, concentration and balance. It restores balance between feminine and masculine, Ida and Pingala; between physical and spiritual. 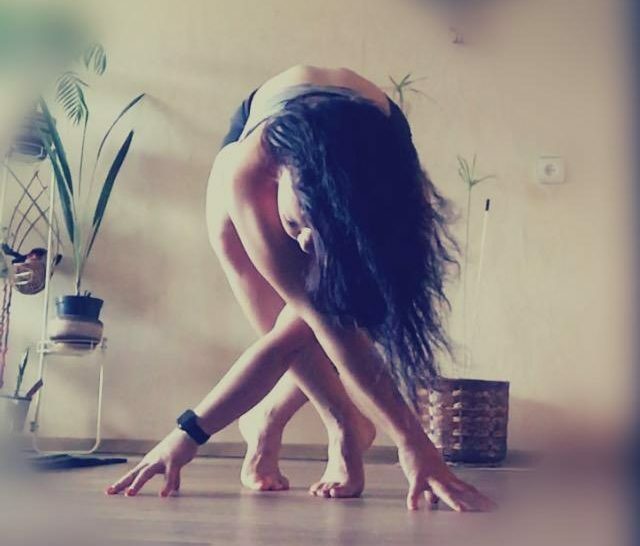 ANJALI MUDRA (palm to palm). This is the most familiar Mudra. It symbolises gratitude, respect and honour. We use it as a Namaste gesture in a Yoga class. If you would like to be more receptive and open keep your palms facing up, when you wish to be more grounded keep them facing down. There are many other fascinating mudras and there is loads of information available on the subject online and in books. Next time you do a gesture with your hands look the gesture up and you will be surprised to discover that you have probably just done a Mudra. Have a lovely week everyone full of positive affirmations!